Formed in the fall 1997, united under the credo "disturb the equilibrium." 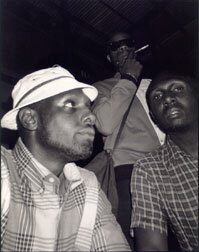 The Anti-Pop Consortium came together as a divergent force to resist the evil empire Hip Hop was slowly becoming. Three vocalist (Priest, Beans and M.Sayyid) and the aural alchemy of E.Blaize converged as a matter of happenstance at the downtown off-shoot of the Nuyorican Theatre entitled "Rap meets Poetry" hosted by poetry slam stalwart Bob Hollman. Priest states "... at that time our style was an ill hybridization of the both rap and poetry so we had love from both sides of the fence". Both Blaize and Priest encountered Beans as spectators. His cathartic tales and childhood reflections delivered with a rapid fire stacatto flow were often a smash. Through a mutual appreciation for each others work, their collaborations resulted in the now classic underground composition "Disorientation" featuring Apani-B-flyMC of the PolyRhythymAddicts. At it's inception the "Consortium" was series of cassette only releases on the then fledgling Anti-Pop Recordings. After circulating the cassettes among divergent taste-makers of the NYC underground the 4-man crew became known as the Anti-Pop Consortium. With an almost religious fervor the team began there assault with an infamous xerox and sticker campaign that landed Priest in jail for vandalism under Giuliani's "increased standard of living regime." Fortunately the police thought that Priest was working a promotions company and let him off easy with the promise that he would cease his defacing of public property (yeah right). Coupled with the verbal pyrotechnics of there live show the Consortium gained the favor of both the staunch B-boy purists as well as the experimental heads. At current their aim is to unite there divergent talents to continue there assault. Both Priest and Sayyid have background in film. Sayyid, an alumnus of San Fransisco's Survival Research Lab has earned credits as technical advisor on Sundance Award winning film Hurricane Streets. The highly sought after producer/engineer E.Blaize has lent his talents to innmumerable major label releases. While Beans continues to increase his profile lending voice to the likes of Arto Lindsey, Vernon Reid along with his solo releases. At the helm of Anti-Pop Recordings, Priest continues provide an outlet for the group's more "extreme" material, while still maintaining the credo...disturb the equilibrium.